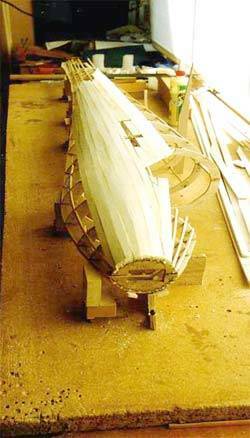 During the early part of 1994, ‘ Martin Simons’ plans were published for a 1:4 scale PWS 101 with a 4.75m span. 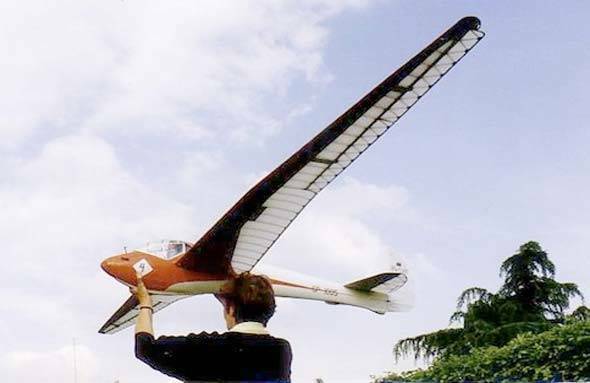 I particularly like a scale glider to look ‘birdlike’ with see-through structure and a bright colour scheme – and this design seemed just right for my next project. What clinched it for me was the cockpit canopy with unusual. rear view fIxed windows! However, its 4.75m span was in excess of what I desired, so I had no option than to design my own to 1/5 scale giving a more reasonable 3.8m span. 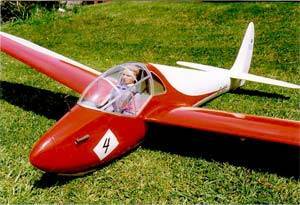 First flight of my model was in May ’95 at lvinghoe Beacon: Dave Stokes obliged on the sticks as I had to take photos – that’s my excuse anyway! Slope lift was doubtful and thermals kept well away, so I could just get in a couple of photos before the model headed for a landing out (expertly done). Duration was I suppose around four minutes. Slight up trim was required, so I put a 1.5mm packer under the tailplane/elevator spar and that is how its been ever since. After this one test flight, it was another two months before I took the sticks for a couple of good flights, again at lvinghoe. No problem with adverse yaw, just a touch of rudder into turns. I’ve yet to couple airleron/rudder on any model, as to my mind this is not the norm. The airbrakes are strictly to scale, but only moderately effective. They are of the DFS type, but differ in that they are not staggered, and are on a through-slot as opposed to dosed. It puzzles me that they were not larger on the full size. Induced, the model will drop a wing, but it’s not dramatic – and stall fairly gentle. As for the wing section, this is non-scale being basically Eiffet 400 with a thickness of 12.833% that has proved to be high lift with quite good penetration. Scale-like airspeed is a further attribute. The all-up weight is 6lbs 130z, with a wing area of 8.135sq.ft, ~ giving a wing loading of 13.4oz/sq.ft. You will not need a course of steroids to launch this model! A few days after my introductory flights, I attended the White Sheet Vintage Scale event. My flying was not to the high level required, but I did leave with a one-piece model and a nicely engraved glass for Best Model. 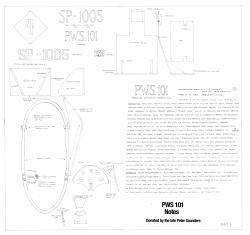 I hope to see a few more PWS 101s in the sky in the future – they do look good! For detailing and documentation, I would advise obtaining a back copy of Silent Flight April/May 1994, also The World’s Vintage Sailplanes by Martin Simons is a ‘must’ for every scale enthusiast. Some information in this article has been extracted from Polish Aircraft I893 – 1939 by Jercy Cynk, published by Putnam. Before you start construction, please study the plans carefully: this is not a beginner’s model, and it is not the sort of project that will be airborne after a couple of weekend’s work! heck first that your building board is flat and true and will remain that way! Lay and securely pin half a fuselage frame. Fit half formers 1-16 and keep glue away from mating joins. Ensure formers 7 and B are spaced correctly and set at 90 degrees. Wing dowel tube centres must match those set into the wings. Formers 1- 3 need a bevel to follow the fuselage contours. Formers 9-16 may warp slightly, but are adequate. Fit spruce longerons and partially plank to stiffen. Soak or steam ½” or ⅜” x ⅛” balsa planking strips and longerons towards the nose to relieve stress. When cutting out formers Fl,5,9,12 and 16 allow extra ply to form cradle supports to jig the half fuselage. Make up a jig following the datum line and secure the half fuselage. Fit longerons and planking as for the side completed, ensuring all is true to shape. You should now have a fairly rigid fuselage. Prior to fitting the fin assembly, continue with the cockpit surround shaping, servo trays and reinforcing to keel splices and skid screw points. The hardwood dowel tube holders need to be accurate and should be loosely bolted to the formers. Make drill holes in the formers slightly oversize to allow for minor adjustment when offering up wings to the fuselage. When satisfied that wings have equal incidence, further tighten the bolts and epoxy lIBin. square spruce strips top and bottom of the· hardwood tube holders to ‘lock’ in position on the formers. Make up the fin assembly according to plan, constituting extended formers Full size copies of this plan 17 and 18. Bolt onto F17 suitable cable turn-round pulley. Stick sighting rods vertically onto F1 and F6. Slide the fm assembly onto the rear of the fuselage and fix. Draw strong threads through the fuselage for later use to install the closed loop cable. Complete balsa planking of the fuselage: I find aliphatic glue best for this job, but do wipe or scrape off any surplus to make the final sanding easier. Make the main spars up to R14, which takes in the full crank at RH. Ribs can be made individually from the plan or by the sandwich method. If the latter, leave them slightly oversize to take account of the taper, and cut or sand back to plan size. Use as pattern for those ribs made out of plywood. Check that the wing joiner tubes are to exactly the same centres as those in the fuselage. Make up inner wing panel to R13, excluding leading edge and sheeting. Construct outer wing panel. At wing crank nose, RH needs to be tripled and a bed of 1I64in ply inserted to receive balsa sheeting. 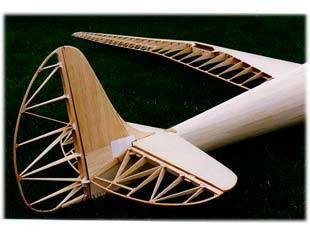 Make suitable supports to jig the wing to correct dihedral and to keep spars to a true vertical. Join the wing sections and sheet upper the ‘D’ box, making sure that supports are securely held to the building board and wing. Turn the wing over and fit sheeting to complete the ‘D’ box. You will previously have fitted air brake and aileron control runs …. At R25 the ‘D’ box is much reduced, so double check that the bell crank operates freely when sheeted both sides. I always try to keep trailing edges to minimum dimension as there is nothing worse on see-through scale models than an over-large trailing edge section. The downside can be some warping, but this is not unusual on vintage sailplanes, and I’m sure performance is not sacrificed. Do be careful not to over-tighten the covering material. Details for the canopy are shown on the plan. I made a plug and vac-formed a one piece canopy, simulating the framework with self adhesive aluminium strip. The nose cone is carved from even-grained Deal, drilled out and lead-filled. My method of retention is to let two lengths of piano wire into the nose block, the free ends being bent round accessible formers. 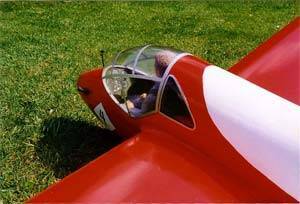 Note: removable nose cones were the norm on full size gliders, allowing access to the rudder bar or other mechanisms. For modellers, it is a useful access for battery and weight adjustment! Main skid is made from 2xll16in. laminated birch ply with foam infill, and an outer covering of natural linen. The rear skid is shaped out of PVC sheet and completed as before. Due to glue lines in the fuselage’s balsa planking, sanding is best facilitated by use of a rigid sanding block. Gussets are somewhat of a chore, but do give that authentic look. You can cut them from paper (saves letting.in) where they do not add structural strength. 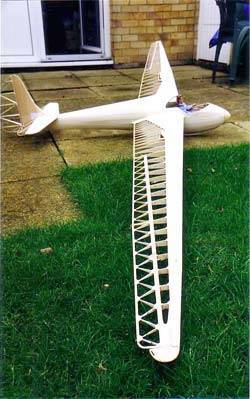 Going way back to a J.S.Weihe I designed which also featured a balsa planked fuselage, I stuck strips of Solartex in place prior to overall covering to simulate formers/stringer positions. I used white Solartex on the fuselage, tailplane and fin and natural Solartex on all other surfaces, with two coats of Humbrol Red 19 gloss enamel over the Solartex to suit the colour scheme. The black lettering was hand-applied. Rigging the model is simple and quick – just remember to secure the wings together through fuselage as tightly as possible.